In this era where communication happens largely via text messages, email, Twitter, Facebook, and the like, it is not unimaginable for people to receive a nasty message and be taken by surprise. Now there is an app for people who want to have a preview of the tone of their messages. The app is called Stress @ Work and is the brainchild of computer scientists from Portsmouth University. The idea is for the app to decode messages and display them using a simple color code so that the receiver of the message will have a warning and not be totally caught off guard in case a really “bad” message arrives. 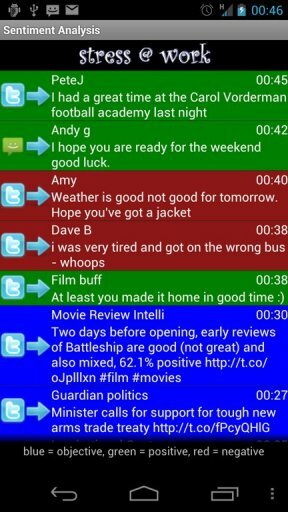 For example, messages with a positive tone are coded green, those with a negative tone are coded red, and those which are neutral in nature are coded blue. The primary goal of this app? To help people be aware of the nature of their messages, and to somehow help in managing stress. I am not sure if knowing beforehand that a message is negative will help alleviate the stress or only heighten it, but the researchers seem to lean toward the former. What do you think? If you are using an Android device, watch out for Stress @ Work toward the end of this month. It should be up and free to download. Those using iOS devices will have to wait a few more months.